I got the chance to try out Rockler’s new Bench Cookies over the weekend. Bench Cookies are like hockey pucks with rubber faces. They act like a routing mat to keep parts from sliding around as you sand or rout them. 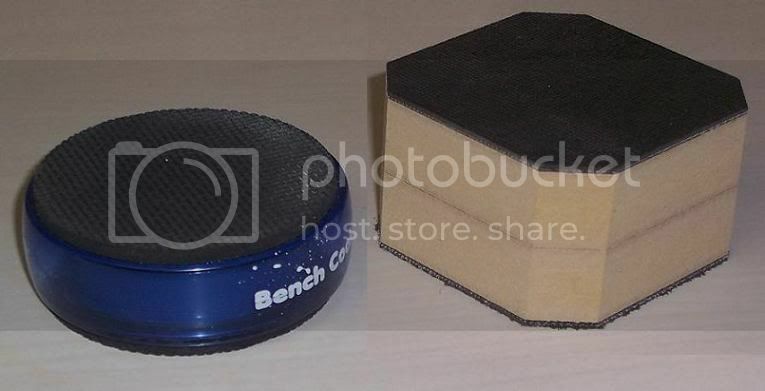 The difference is that Bench Cookies lift the part up about 1” off the work surface so that you have clearance for bearing bits or cut throughs. They work surprisingly well, I sanded and routed parts on them with complete confidence. I even covered them in sawdust to see if that changed the effect. It does a tiny bit, but I piled dust on them. They still worked. I’ve got two sets of these that will be delivered on Monday. I’ve talked to a couple folks who have used these as well as seen several on-line reviews. Everyone has been very positive about their experience with these pieces. I’m glad to see another positive since I’ve already bought them! I’m getting both this weekend as soon as the doors open! I’m like a kid on xmas morning! Thanks Ralph totally new to me.Thanks for the review. Ralph – I’m a skeptic, so though I was a Rockler employee (Burnsville, MN store), our guys at the store did the same thing – cake them up with sawdust and they did rather well. 1 out of 4 was a bit loose, but we just turned them upside down, one tap on the table and back under the workpiece and it was like new – no slip even though there was still some sawdust on them. I bought a set that day…. With the seemingly endless variety of bench dogs, clamps of every configuration, hold downs/holdfasts, and sticky drawer liners, these cookies might seem to be up against reliable and proven competition. Still, the new cookies seem a good product that’s easy to fall in love with and destined for success. Created and launched very carefully: Easy to understand; easy to use; and at an easy to accept pricepoint. Not sure if I’d change my shop’s work-holding habits—those grip mats trimmed to fit under the entire workpiece are just so elegantly damn good! However, what about an unintended or secondary benefit of the cookies? I wonder how effective they might be as isolation pads? Such as a motor mounted on a board with rubber washers/grommets, and then place a set, or a series of these cookies under the board to dampen sound and vibration. I have all sorts of hold downs too, but I was trimming a bunch of edgebanding recently with the router. (like shown in the video) I was able to lay a side down, trim it, pick it up and flip it over, all with one hand. Really speeded up the process not having to clamp and unclamp every cut. For the price, I can save a lot of time and effort. Mine arrived before we left on vacation. Tried them yesterday. Edge routing. Work well. set them on a piece of drawer liner. Very secure. I thought I had everything for my workbench … then Rockler came out with ‘Bench Cookies’, and all of a sudden they became a ‘must have’. I have used them to route profiles around the outside edges of raised panels without the use of any clamps, hold-downs or dogs, which means there is nothing to get in the way of the router bearing. Since the raised center of the panel is proud of the rails & stiles, I couldn’t route the profile on my router table, and when I would do the profile on the workbench, I could only do half of it before stopping and rotating the workpiece in the bench dogs. The ‘Bench Cookies’ solved that problem. I was initially concerned about sawdust buildup on the rubber surfaces, but so far that hasn’t been a problem. I used them to sand maple and oak with 400 grit sandpaper, and just used my ShopVac to clean the rubber surfaces to look like new. And they seem to grip well even with a pretty generous amount of sawdust on them. Another great idea from Rockler! I bought 3 sets and decided to make my own version. MDF and black rubber like shelf liner from Lows and a little contact cement. I made 30 for about 10 cents apiece. I cut the block to size after gluing every thing up. Took about an hour.